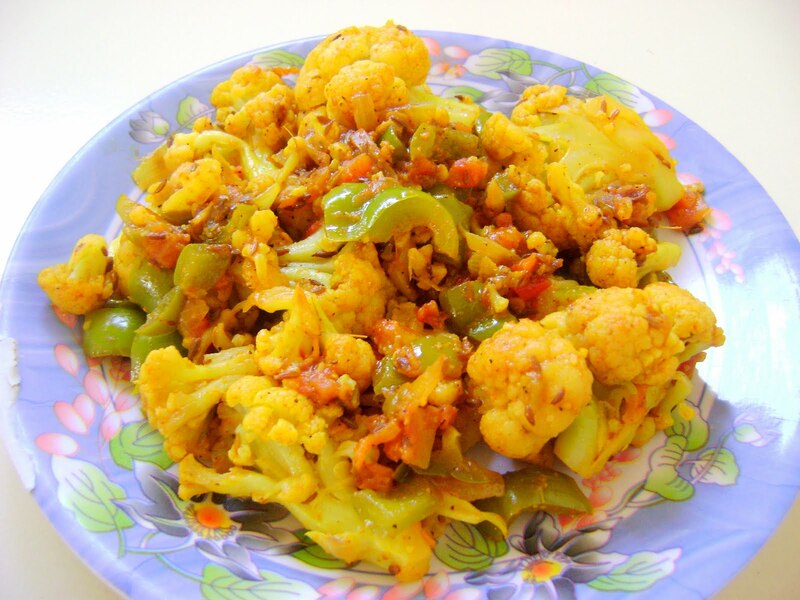 Treat Yourself With This Delicious Gobhi Shimla Mirch Recipe! The common cauliflower tastes unbelievably exotic in this spicy gravy. As always, capsicum adds a special touch. Combine a vesselful of water, salt, turmeric powder and cauliflower, mix well and cook on a medium flame for 4 to 5 minutes or till the cauliflowerflorets are parboiled. Drain the cauliflower and keep aside. Heat 2 tbsp of oil in a broad non-stick pan, add the cauliflower, mix well and sauté on a medium flame for 2 to 3 minutes. Add the capsicum, mix well and cook on a medium flame for 2 to 3 minutes, while stirring occasionally. Sprinkle a little water if the vegetables begin to burn. Keep aside. Heat the remaining 2 tbsp of oil in a kadhai and add the cumin seeds. When the seeds crackle, add the onions, ginger-garlic paste, mix well and sauté on a medium flame for 2 to 3 minutes. Add the chilli powder, garam masala, green chillies and dried fenugreek leaves and sauté on a medium flame for 1minute, while stirring continuously. Add the tomatoes, little water, prepared vegetables, a little salt and coriander, mix well and cook on a slow flame for 2 to 3 minutes or till the masalas coat the vegetables evenly, while stirring occasionally. If you loved this recipe, please feel free to share by clicking one of the share button below. Next post: There Is Nothing Like Humane Wool!!! Read More!! Previous post: Herbal Remedies To Lower Your High Blood Pressure!